2 days ago, I read an article (if you read Mandarin) on newspaper, and interested to pay a visit for some spy shots on the giant. Apparently if you google on this giant, you can find quite a number of Malaysian blogs that criticize why the G allowed this biggest aircraft carrier to dock at our port since it's heading to the Gulf for war crimes against Iraq and/or Iran. 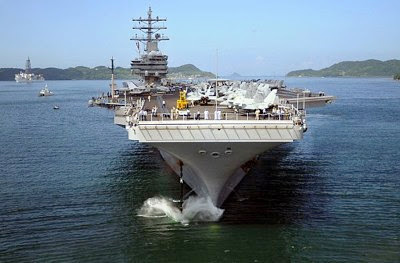 I am not a politician, I just wanted to kill my curiosity how big is the carrier and how grand it looks like. I am peace supporter, but I don't think I am BIG and influential enough to change its destination with my protest or by not taking photos on it. Imagine Top Gun's Tom Cruise was playing baseball at the deck... and Tom Yam (me) mopping the deck there (Hot Shots, parody movie of Top Gun). Haha! Tom Yam failed on this mission! The fortunate out of the unfortunate, I met a very nice gentleman, Mr Murali who works there, offered me his email address, and he or the authority will email me when there's such foreign military visit again if it's open for public visit.